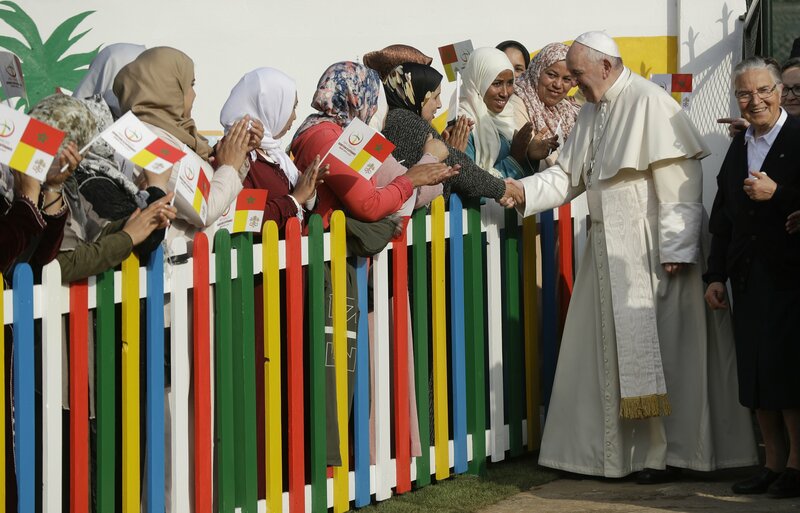 RABAT, Morocco — Pope Francis sought Sunday to encourage greater interactions between Christians and Muslims in Morocco, telling his flock that showing the country’s Muslim majority they are part of the same human family will help stamp out extremism. After reaching out Saturday to Morocco’s Sunni majority and its growing community of migrants from countries in sub-Saharan Africa, Francis turned his attention Sunday to the country’s Christian minority. His aim was to highlight their constructive presence in Moroccan life. Francis visited a social center run by Catholic religious sisters that serves a poor Muslim community south of the capital, Rabat, with medical, educational and vocational services. The Temara center operates a preschool, treats burn victims, trains women to be tailors and provides meals for 150 children a day. Among the priests on the altar to greet the pope was the Rev. Jean-Pierre Schumacher, the last survivor of the Tibhirine monks. Schumacher and his brother monks had decided to stay in their monastery in Tibhirine, Algeria, alongside locals during the country’s civil war, despite the threats against them. Seven monks were abducted and beheaded in 1996, their skulls discovered nearby. A radical group was blamed for their beheadings, but some observers have suggested that Algeria’s military was responsible.